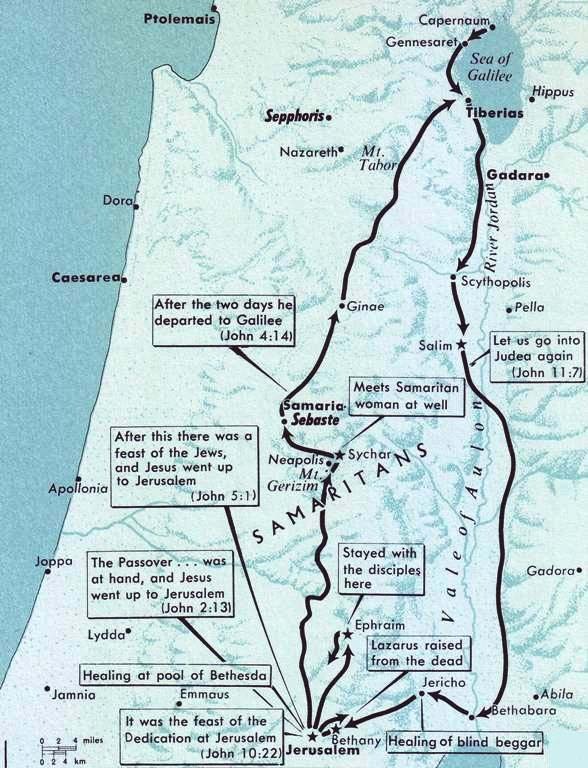 The gospels according to John records several more journeys of Jesus to Jerusalem about which the other Gospels are silent. Thus, in John 2: l3-3:21 there is the story of a visit to Jerusalem at Passover, during which Jesus cleansed the Temple of money-changers and sellers of animals, an event placed by the other Gospels in his last days in Jerusalem (Mark 11:15-17; Matthew 21:12-13; Luke 19:45-46). 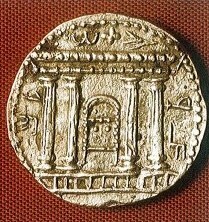 Below right is a 1st century coin showing the facade of the Temple rebuilt by King Herod the Great. 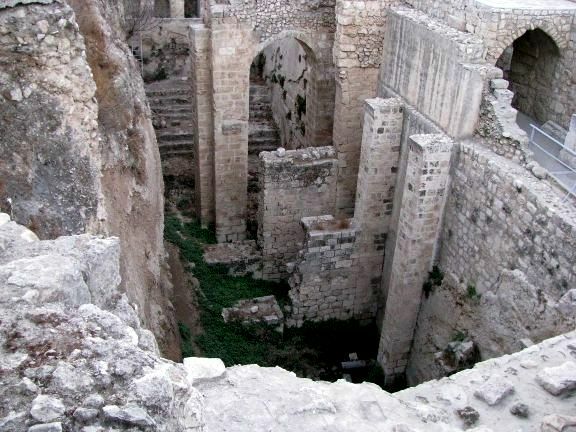 During this stay Jesus was baptizing in Judea while John was doing the same in the well-watered plain of Aenon, near Salim (John 3:22-24). 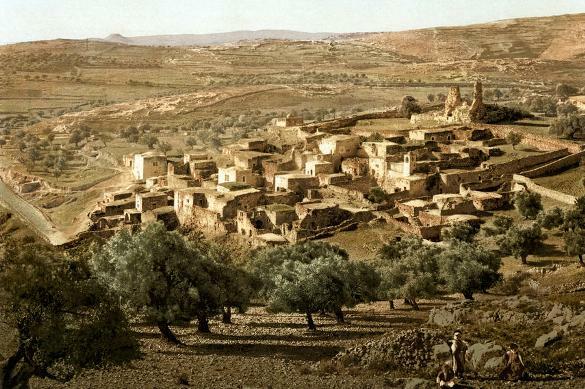 It was on his return from this ministry in Judea that Jesus passed through Samaria and met the Samaritan woman at the well of Sychar, staying two days with the Samaritans, many of whom believed in him. 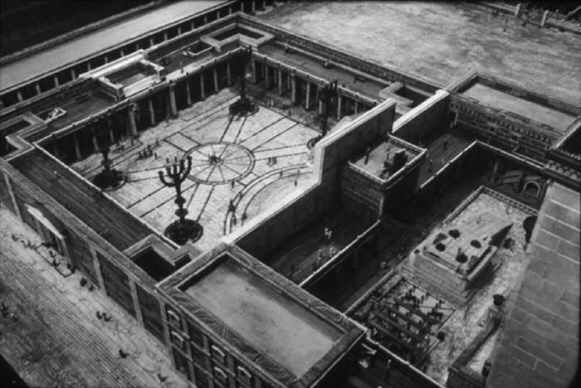 One more journey to Jerusalem, during which a paralytic was healed at the pool of Bethesda in the Holy City. is recorded in John 5. John 7 gives a slightly different version of Jesus’ last journey than that found in the three other gospels. According to John, he went secretly to Jerusalem at the Feast of Tabernacles (in the autumn), and was still there at the Feast of Dedication (in early winter, John 10:22). After this he returned beyond the Jordan, probably to Bethabara (John 10:40). He then came back to Bethany, raised Lazarus from the dead (John 11:1-46), and retired once again into the wilderness of Ephraim, northeast of Jerusalem (John 10:54).